I can’t express how much I grieved for the victims of recent flood that occurred in my country these past few days. We’ve been challenged by a heavy storm that beyond any doubt affected hundreds of families and cities at lower areas. I as well suffered from the consequences of Mother Nature’s wrath. Fortunately for my family we’d been saved by our own lot which is stand elevated among others. The house and the parking lot are far beyond the water planted outside. But it gives me chills as I remember staring at the stagnant flood didn’t even bother to move a bit. Motors and other vehicles were having a hard time roaring the low-leveled water as it may still possibly cause damage to mechanical parts of cars and vans specifically. But no one can really stop the rain. As the people flee from houses to houses to evacuations, the storm is taking its time bringing more drops to cry over the land thus forcing me to leave my work for 3 days. Within those times I’ve been going in and out of my comfort zone and watch people soak their feet and legs into germ-infested water. No choice but they need to move on and continuously search for food and flood-preventive gear. Amidst the disaster, I was more worried of the items that are currently in production because of the storm. I’ve heard some of our shops were also affected by flood but the idea of “what-happen-to-the-item” is clearly out of my signal. 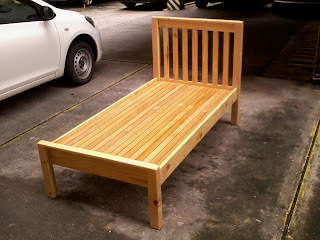 I spend most of my time thinking about the bed which was given to one of our workers before the storm. I can only have bad thoughts at those times since no good is happening to my country. I’ve been dealing with mixed emotions and nervousness every time my thoughts transcend to think about it. After 3 days of mentally suffering alone in my room, the day came for me to step my feet off of the house and brighten my day to hide all the stressed I caught by thinking those bad scenarios. As I begin my work, I immediately called the worker and to my delight the item was saved. Guess what? He placed it on the roof. The bed is one of the furniture he immediately pulled-out and gave attention to. My heart can cry out loud now! He reported the item is already finished when the storm visited the land. He covered it with plastic (the elastic one) to halt any damage that may bring forth to the furniture. I was surprise even more when he told me that the paint, coated on wood, was in good condition even after the weather change its mood. As a matter of fact, before the storm I was asking him if we can look and get the item for ocular inspection. We’re supposed to deliver the item in the office but when our delivery boys landed in their shop, the storm is already at its full swing. In fact, we’re all having a hard time getting hitch or even move our feet to walk and go home. Thus, the item was stocked in the fabrication for days. As the weather calms and the sun wakes, the bed lied on our floor like it never gone through deluges. Below is the Camilla day bed. 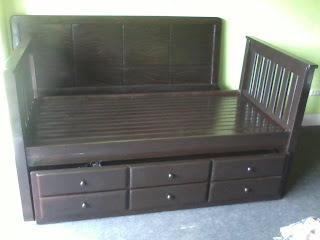 The bed that gone through many obstacles but it is safe and sound now. Below is the studio version of the bed and the following pictures were the actual images. Enjoy! 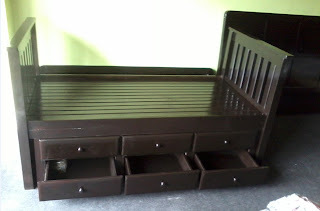 The furniture is comprised of base bed, pull-out bed and 3 drawers. It is made of solid wood and plywood with vertical line attached to the headboard and footboard as the prominent style for the bed. The pull-out drawers have 4 wheels or rollers and a drawer guide as a stopper. 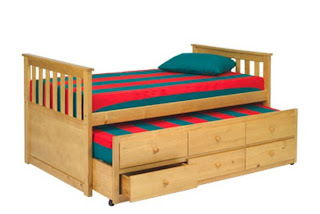 Camilla day bed with pull-out bed and drawers stretch. With all the images I’ve shown you through this blog, it’s only essential for me to give you the actual photos of studio pictures I shared. In my deepest files of furniture kept in the laptop I will now show you our humble products. The Eddy is 4seater dining set which is made in Mahogany wood and finish in maroon coat with dark spots to complete the granite like finish on it. The chair got a high backrest to support your back all the way through. I ask one of our workers to make me a side table for bed with the size according to my measurement. The size is kind of too big for a side table but the reason why I made it like that is because I planned to place my laptop above. The size of the laptop together with the bag just fits perfectly at the top table. 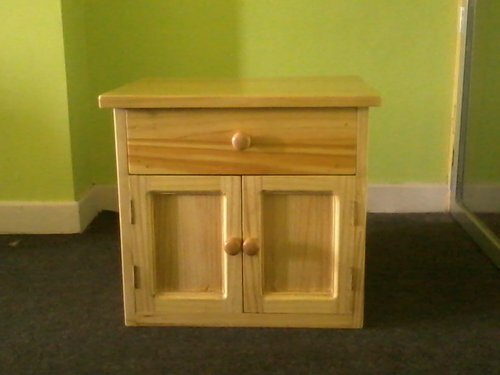 However, what made this side table cute is the doll house-like appearance. The small doors with big knobs are what makes me giggle every time I’m staring at it. 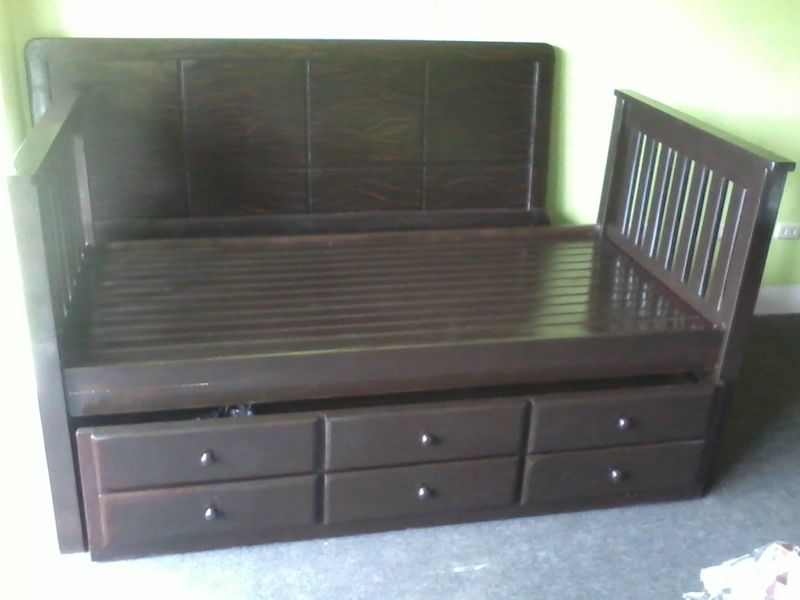 This bed just delivered yesterday for viewing. Made of Pinewood as well and in natural finish. The ever cute haspy is there again to show how beautiful she is. The size is below standard, I think 32” W x 64”L. The item is still here in office and was schedule for viewing this week or the following. The design is simple but the simplicity itself made the whole situation lovable! And last but not the least, a simple white bed. The McKenzie bed is a queen size bed in white finish along with a dresser with the same finish. Usually white is the most difficult in all finishes because it requires a lot of time, several coats and a high gloss paint to imitate an automotive type. 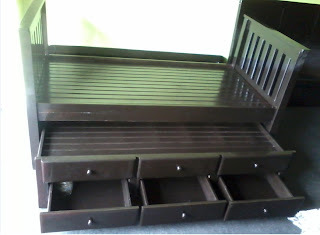 However the bed in the picture is just in white glossy finish not ducco. And for us not to fall into substandard quality, we decided to apply several coats in it and (I think) polyurethane also used to attain the glossy finish that the automotive type had. However, the glossiness is not par of that high gloss finish. For now, I give you four items. Yes, I know I could've paste more. But I want to save those actual photos for another blog. Watch out for next entry featuring these actual images.